Special thanks to Ryze for sponsoring this recipe post. It’s pumpkin season and I am going crazy with pumpkin recipes in the kitchen. I love pumpkin everything and I cannot wait to share all things pumpkin with you, including this Gluten-Free Pumpkin Chocolate Chip Skillet Cookie. Do yourself a favor. If you ever think about a pan for months and months, buy it! It’s meant to be. Think of all the fabulous dishes you’ll cook in it. I’m not associated or affiliated with Finex, I just like their pans. 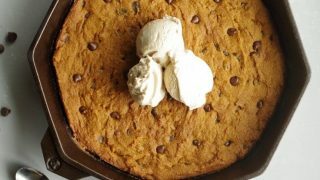 You can use your favorite cast iron skillet when you make this Gluten-Free Pumpkin Chocolate Chip Skillet Cookie. Just be sure to use a 12″ cast iron skillet or the baking time will be off. Before making this Gluten-Free Pumpkin Chocolate Chip Skillet Cookie, I hadn’t used our skillet for anything other than making dinner. Sure, I’ve seen tons of recipes for skillet pancakes, dutch oven cakes, and skillet cookies – but this was honestly my first time making a skillet cookie outside of using our cast iron pot when camping. 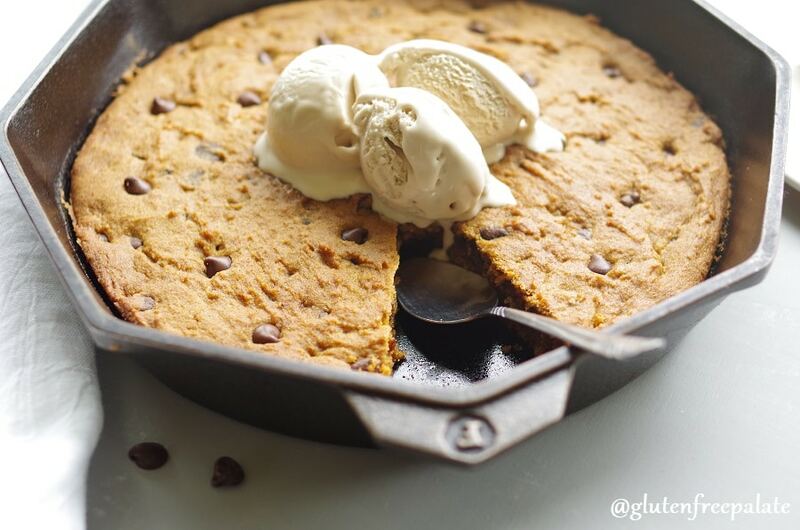 Can I make this gluten-free pumpkin skillet cookie dairy-free? Yes. Just use dairy-free butter and gluten-free, dairy-free chocolate chips. We use Enjoy Life Foods Chocolate Chips (affiliate link). 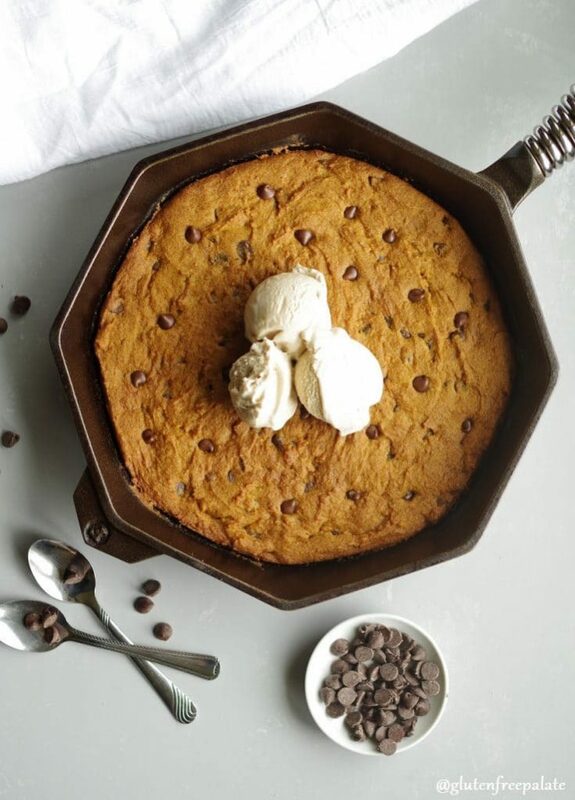 This Gluten-Free Pumpkin Chocolate Chip Skillet Cookie is super simple to make. You mix up the cookie dough like you would normally, and you spread it into the cast iron skillet. No need to oil the pan, as your cast iron skillet should be well seasoned. After you pop your skillet cookie into the oven, sit back and relax while the amazing aromas of cookie and pumpkin fill your house. 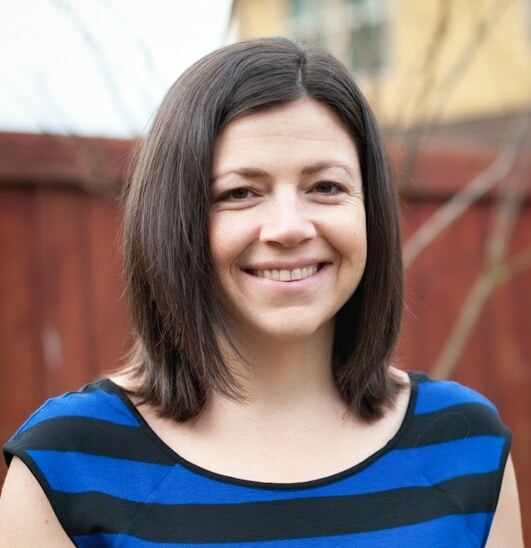 What if I don’t have a cast iron skillet? No problem if you don’t have a cast iron skillet. 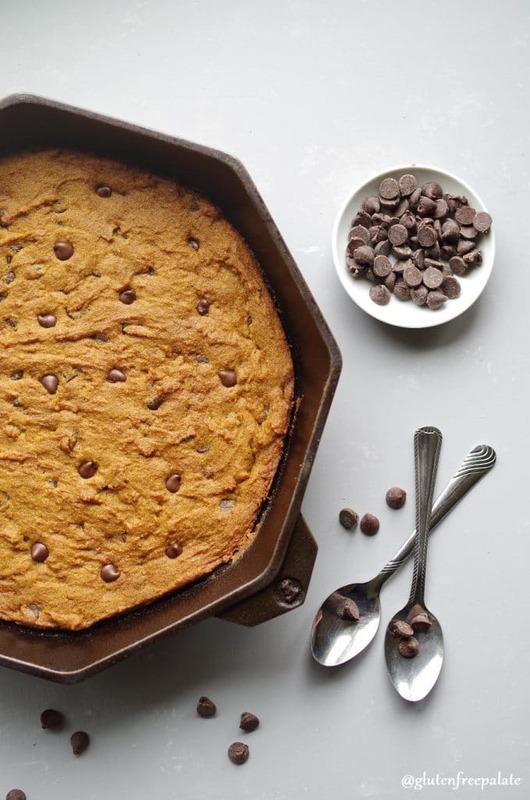 You can make this gluten-free pumpkin skillet cookie in a 12″ metal baking pan. If you don’t have one that big, divide the dough in half and bake it in two smaller ones. Just note, it will cook a little differently due to the pans not holding the heat the same way cast iron does. I don’t have Ryze flour, what else can I use? I’ve used many blends in this recipe. While I think Ryze flour works best in this recipe, you can also use Bob’s Red Mill 1-to-1 Gluten-Free Flour Blend (affiliate link). This might be the only pumpkin skillet recipe I have, but I have other pumpkin recipes for you to enjoy. My Grain-Free Pumpkin Bars and Gluten-Free Pumpkin Donuts are pretty incredible. Pop over and take a look when you have a moment. Save the recipes for a later date, or print them straight form your computer. If you make this gluten-free skillet cookie please stop by and let me know what you thought. 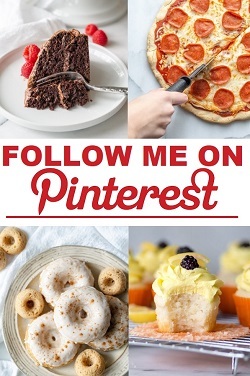 If you have a question about the recipe, leave a comment and I will gladly get back to you. 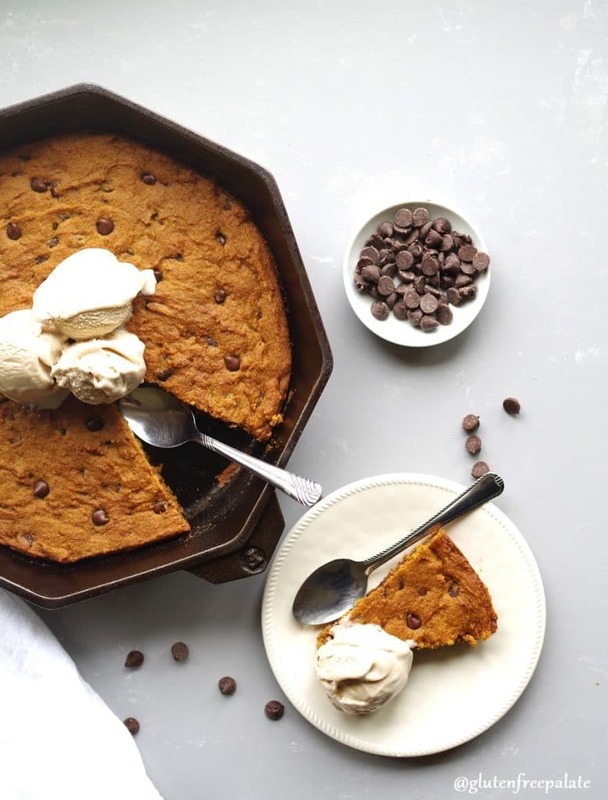 Break out the cast iron skillet because I've got a Gluten-Free Pumpkin Chocolate Chip Skillet Cookie recipe that you're going to love. In a large mixing bowl with a hand-held electric mixer, cream together butter and sugars. Add egg, pumpkin puree, and vanilla, and beat until well combined. In a separate medium mixing bowl, whisk flour, baking soda, pumpkin spice, cinnamon, and salt. Add the dry ingredients to the wet ingredients and mix on low speed until just combined. Spoon batter into a well seasoned 12" cast iron skillet. Spread until even. Bake for 22–24 minutes or until the center is mostly cooked. Remove from the oven and let cool. The cookie will continue to cook as it cools. Oh yes! Love the pumpkin addition in here. Looks wonderful. I have a skillet cookie recipe that’s calling for some pumpkin now!!!! Oh my goodness! 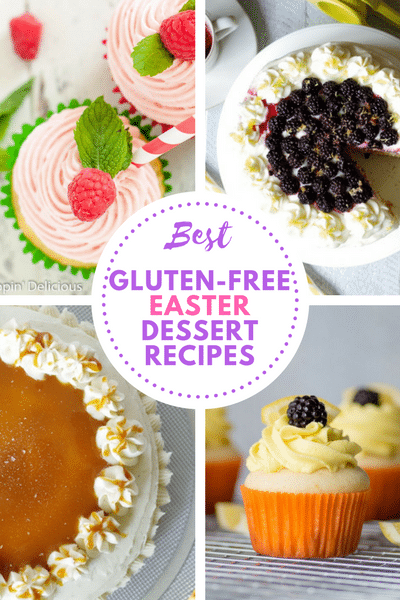 This would be perfect for this weekend’s dessert! OOHH!!! I love pumpkin chocolate chip cookies, so I bet this is even better! What an amazing dessert, Chrystal! And so perfect for the Fall. My family would LOVE this. I’m MUST add pumpkin to my skillet pie next time!